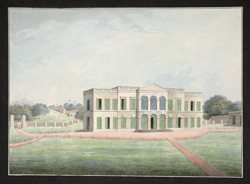 Watercolour of the rear view of the East India Company's Factory at Cossimbazar in West Bengal by an anonymous artist working in the Murshidabad style, part of the Hyde Collection, c.1790-1800. Inscribed on back in ink: 'North view of the Cossimbuzar Factory House. '.